Looking for something different for your Georgia beach wedding? Or do you need an attention grabbing live band for your next corporate seminar? RythmTrail is the premier Steel Drum Band in Georgia and plays the best soca, classy calypso, rocking reggae and fabulous steel drum music and can be reached here with just a click of your mouse or phone call. Real native Caribbean island steel drum players with over 20 years of experience will ensure your party, gathering or event will be rocking to the sweet sounds of one of the best steel drum bands in the state. You can hire our entire steel drum band for a fantastic full-on steel drum experience or just one of our terrific performers for a great solo performance and make certain your beach wedding, corporate event or house party is one that you and your guests will never forget. 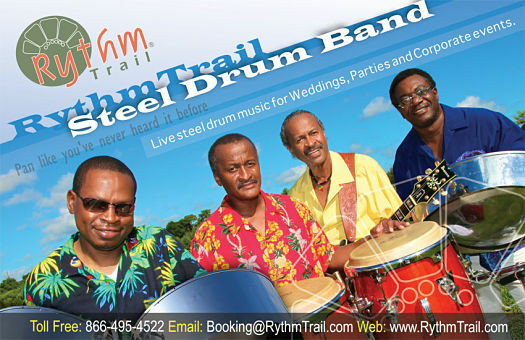 Book RythmTrail right now for your gathering and whisk your guests away to the tropical islands with the beautiful sounds of the RythmTrail steel drum band. RythmTrail offers great steel drum music in Georgia from the beaches to the mountains, as well as nationwide and internationally. From the best ceremony music for your beach themed wedding to a unique corporate seminar, RythmTrail can jam all of your favorite music anywhere, and at any time. You can even create your own personal playlist of tunes or let RythmTrail do the job for you and provide an upbeat, romantic or even dramatic theme that will set the mood for your perfect party. What are you waiting for? Call RythmTrail today at 866-495-4522 or get a free quote online and turn your next event into a tropical island paradise. Gina and I wanted to let you know that everyone at Shay and Felicia’s wedding thought the steel drums were a unique and wonderful flavor to the event. The music was great! It was very easy to work with you. Please feel free to use us as a reference. We will fully recommend to anyone that they should choose you. We all (our family and guests, as well) loved your music at Matt’s rehersal dinner! my mind and that was so thoughtful.